This is a cost in addition to your accommodation tariff. Centennial Glen Stables (neighbouring property – 2.5kms: approximately 10 mins drive) can cater for all of your horse needs. Horse riding for beginners to experienced riders. 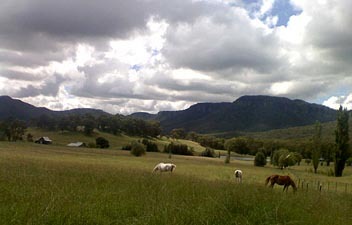 Mountain trails, open paddock, lead horses for children & beginners. Safety helmets provided. A unique experience is the Drive Your Own Sulky option! They now offer an “All Day Experience” which includes catching, grooming, saddling and other skills. Great for horse mad kids! All these activities are by appointment only. Bookings are essential. (02) 47 871193 or 0438871193 for reservations. Horses may be patted but NOT ridden and the cattle are NOT “pattable”. Please do not feed anything to the cattle or horses….they are on strict diets ….grass, that is! Depart from the Shearing Shed and Cabin entrance gate and walk uphill along the road. 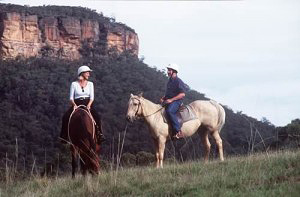 Stop at the top of the hill (gate and cattle yards) and admire the 360 degree views: NORTH, EAST, SOUTH to the Blue Mountains escarpments and WEST to distant blue hills. If you wish, continue through the next gate and down the hill. You may walk along the road until you reach the next cattle grid and the gate. This is the end of our property, so please proceed no further. On your return walk, enjoy the fresh air and ever changing views of the cliffs and mountains. A walk in the early morning and then again in the late afternoon will reveal very different colours and attributes of the escarpment. This is a cross paddock walk…driving in paddocks is definitely not permitted. Proceed as for “Country Road” walk….go along the road and up the hill. Go through the gates at the top and down to bottom of hill. There are 2 metal gates (on your right). Use the right hand one…faces more towards mountain. Duck under the white electric tape or unhook it. Continue left along the fence line (north) until you reach the gate on the far side of paddock (metal, near a power pole). You are now entering the Creek Paddock. You will notice that the land steps down steeply to the creek and tree-line. Please do not cross over the creek as it is our boundary with our neighbours. As you wander along the creek you will observe many wombat holes (especially in the sides of the creek bank) and fresh droppings. 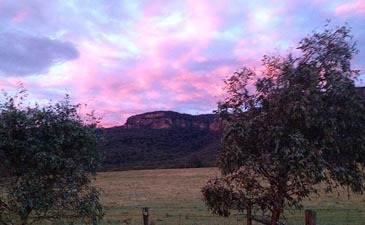 A walk in the late afternoon means you will probably encounter wallabies and kangaroos. Wombats usually only come out when it’s quite dark (8 or 9pm). Continue following creek to the right and this will bring you through two gates and back towards the cabins.